A young teacher is murdered and the police officer who looks to be assigned to the case hides the fact that she knew the victim, and perhaps is troubled for reasons the reader will uncover. 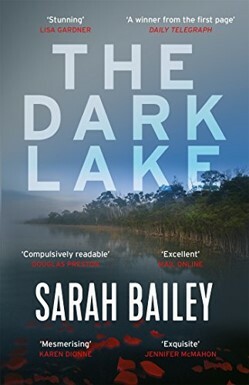 The principal [and perhaps only] focus in this debut novel is the main character, the police officer, rather than the small town murder in Australia. Though mooted by the publisher, for readers of the award-winning The Dry by Jane Harper, it shares little in common; apart from the small-town antipodean backdrop and that both works are debut crime novels. Though the story is solid, and written well, despite the narrative revolving around one character, DS Gemma Woodstock - one that the reader has trouble empathising with as she is so unpleasant. Secondary characters unfortunately do not offset this factor. DS Gemma Woodstock’s history is naturally important to the story, but as she is such an unpleasant character, it makes the reader work hard, to keep engaged with the story. As a debut this work is interesting, but with such an unpleasant main character, one does wonder if some readers will reach “the end”.